Borderlinx | Buy ebay Germany and ship worldwide with Borderlinx. Cheap rates guaranteed. Shopping Ebay Germany is super fast and convenient and browsing all the latest products is easy and pleasurable. Connecting buyers and sellers' world wide and offering the latest gadgets, fashion, accessories and a whole host of incredible products. Constantly improving and proving they are the leaders in online shopping, Ebay Germany is a dynamic global marketplace. Discover great value and find out why the world loves to shop and sell on Ebay Germany. Not only are they selling incredible products, but they are only getting started on their road to economic opportunity for small and large businesses. Ebay Germany online offers the latest fashion trends, finding what your next outfit needs to be, is a simple click away. Cool new Ebay Germany homeware designs and quirky accessories, will have you the talk of the town. Electronics, games and fitness accessories, will ensure there is something available for everyone. Ordering is simple and don't forget to keep a look out for all the special offers constantly changing and available. 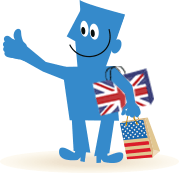 Walk away from your Ebay Germany online shopping experience as a truly satisfied customer. As easy as it is to order with Ebay Germany, it is just as easy to arrange your delivery with Borderlinx after you find out how it works. You can easily calculate cheap shipping costs, taxes and duties and see why you need to sign up with Borderlinx. Shipping to over 64 countries ensures, fast and safe delivery. A number of services are available through Borderlinx to make international ordering from Ebay Germany hassle-free, including shipment value protection, free repacking and consolidation services.